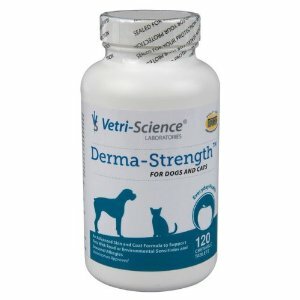 Vetri-Science Laboratories’ Derma Strength for Cats and Dogs is an advanced formula to support skin health and post surgical recovery in cats and dogs. It includes important ingredients that support the immune system response and circulation, tissue recovery, histamine level maintenance, and protection against free radical damage. Essential fatty acids DHA and EPA support circulation and cellular integrity and health. DMG provides immune system support, while hyaluronic acid supports tissue hydration. The inclusion of MSM supports collagen production and contributes to skin texture and elasticity. Derma Strength also contains grape seed extract and perilla seed to support a healthy histamine response and manage histamine levels within normal ranges. Derma Strength is available in an imitation chicken flavored chewable tablet. Directions for Use: Give 2 tablets per 30 lbs of body weight, daily. For cats and dogs less than 20 lbs give 1 tablet daily. If giving more than 1 tablet daily, divide between AM and PM. Inactive ingredients: brewers yeast, calcium phosphate, cellulose, fish oil concentrate, natural imitation chicken flavor, stearic acid, silicon dioxide.